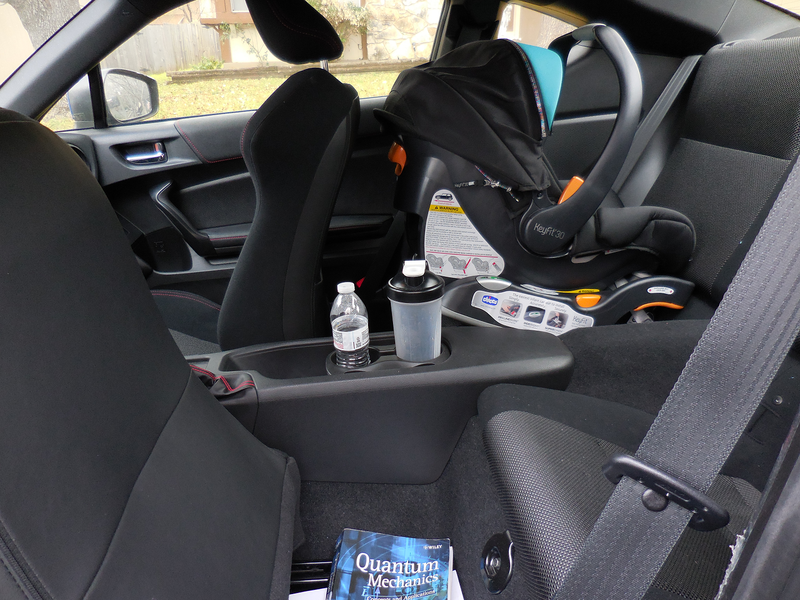 Can an Infant Car Seat Fit in a Subaru BRZ? 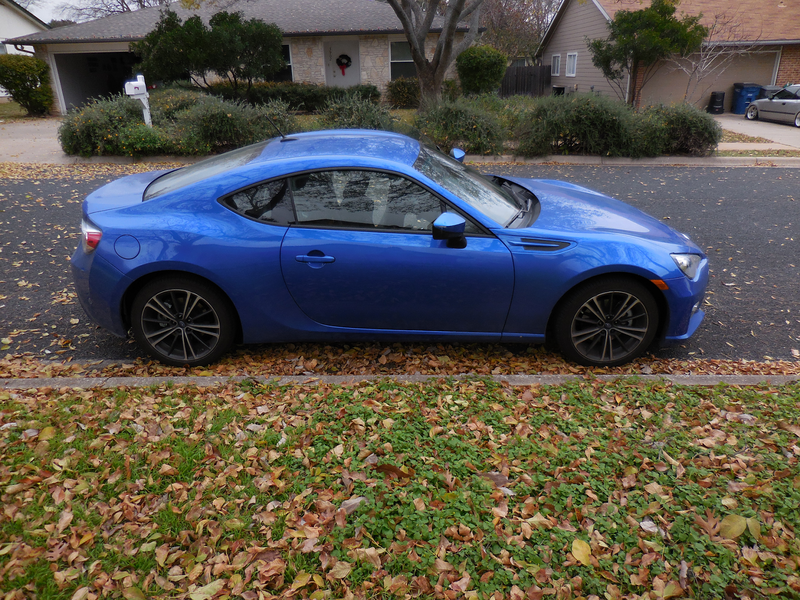 I have a two month old and a very small sports car (Subaru BRZ). Can an infant car seat fit in this or will the baby require the biggest expense yet in a new car? None of these cars are baby-friendly, but we weren't planning to have a baby for a couple of years so that was a problem for future me. I settled on the 2013 BRZ, and as you can see from the picture above, the backseat is basically non-existent. Was there any hope of fitting a rear-facing, infant seat in there? We tried them out at the local Babies "R" Us, and felt that the Chicco was the most promising. View from passenger's side door. Note that the gap between the two seats is sufficient. Working in our favor is that the backseat has hooks for the seat base, the front seat slides very far forward on the passenger side, and there is a gap between the seat back and the door opening that makes it easy to get the seat in and out. Working against us is the shape of the back seat (it slopes down sharply), the fact that it's only two doors, and the fact that the seat on the driver side doesn't slide forward as far as I'd like to be able to easily get into the backseat on that side. To handle the angle of the backseat, I took old shirts and used them to flatten out the seat a bit (they're stacked under the seat base with the stack being thicker as the seat sinks in). The Chico base is adjustable, but I didn't find a setting that worked perfectly for this. To get him in, it's easiest to pull the seat off the base, put him in it, then put the seat back into the base (we often do this with my wife's 4-door also as it's convenient). You can also get in the backseat on the driver's side and put him in there if you prefer. As is probably obvious from the pictures, the front passenger seat is somewhat useless, but my wife gets sick when she rides in this car anyway, so that's a non-issue for us as we always use her car if we're both in the same car. 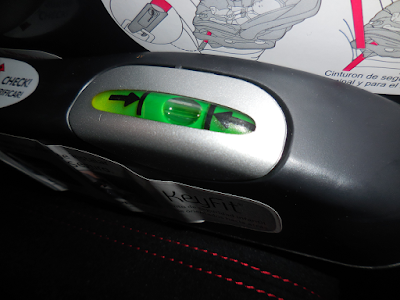 If you don't need to use the front passenger seat and can afford to spend >$200 on a car seat, this isn't too bad and the Chicco Keyfit 30 works for me. Note that all of this also applies to the Scion FR-S.
MY SON AND WIVE DRIVE SMART2 AND MAKE BABY SEAT OUT OF DUC TAPE BECAUUSE OF SMALL BACKSET. GOOD TO SEE BABSET FIT IN YOUR CAR BUT HAVE YOU TRIED SUNFOOR? Thanks for posting this! We have a baby on the way and I've been looking all over for a good answer on a rear facing infant seat for the BRZ. Just like you guys, we were not planning a child when we bought the car...but things can change in 2 years huh? It's been tough to find a definitive answer on this, so I am really happy I can stop worrying about getting rid of the BRZ. Actually, one follow up question. Do you have a stroller that fits the Chicco KeyFit 30 that also fits in the BRZ trunk? I haven't actually tried a stroller yet...we just carry him or him+car seat around. I think we might try one in a few weeks since he keeps getting heavier, so I'll come back and edit it with that info once I have it. So after measuring and a little bit of research, I think the Baby Jogger City Mini GT. It folds really flat relative to other strollers I've found, and they have a universal adapter that fits the Keyfit 30 seat. Thanks for the research. We live less than half a mile from our daycare, so I'm planning to walk/jog him there when the weather allows it and am planning to look into jogging strollers once he's a bit older (it feels like the bouncing might be hard on his neck this early). I'll check this one out. Just to warn you, you might find yourself doing this sort of stuff a lot. I missed an entire night's sleep when my wife was around 8 months pregnant because I freaked out about the baby falling and dying from a head injury when he was learning to walk and had to know that instant how to baby-proof for falls. I obsessively took pictures of his diapers every day for a while because I was convinced his poop was changing color (it wasn't). You'll find yourself doing the most random things, but it's kind of fun. 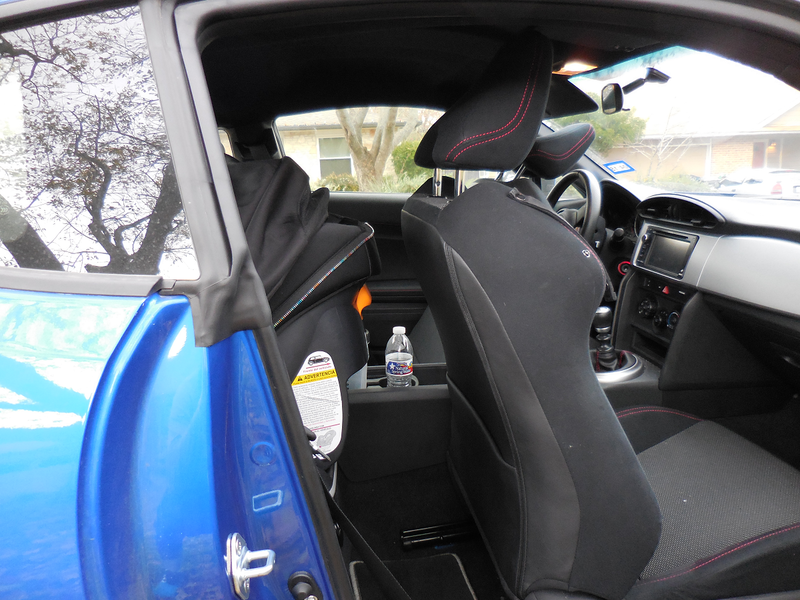 I'm in need of a car with a infant seat in my BRZ. Your post is really useful for me. Thanks for sharing this post! Infant car seat is always necessary because it will make it more safe for those infants, so their parents don't have to worry too much about them. Thanks for this post! Infant car seat is very important for 1-7 years child for long or short tours. That is why parents should try Infant car seat always to keep safe their child on the road. Thank you so much. This paper writing service would be a nice help for all the internet users interested in educational and writing related articles. Great informations! There are several ways of ensuring your chosen seat is fitted correctly but if you are ever in doubt, a visit to the Check It Fits service will put your mind at ease. Read about the best infant car seat reviews. Thanks! no doubt you are doing good. I really loved reading your blog. It was very well authored and easy to understand. Unlike other blogs I have read which are really not that good. We make sure that all lotto result today that we post are accurate. However, we still encourage our visitors to visit the official PCSO website and verify the game results from there. William Tyler is the CEO of Octink, an award-winning display specialist. Octink is based in Brentford, London in the UK and provides marketing butik skyltar environments, event branding and sign services from design and production, through to installation and project management. I really loved reading your blog. It was very well authored and easy to understand. Unlike other blogs I have read which are really not that good. Wishes have no religion like hollywoodneuz.net wishes for Christians are same as that for Muslims and Hindus or Buddhists and all other religion. Visiting magicians thus far for the new millennium have included Joshua Jay, Shoot Ogawa, Charles Gucci, Nicholas Einhorn. J C Sum is the Creative Magic Producer and Founder of Concept:Magic, a production house that provides high-end magic-centric consultancy for events, television and live shows across Asia Pacific. Accommodation factor with this phase of car seat is that most models will have a carry handle empowering you to effortlessly you can download all your favorite drama download sites apne tv in different languages. There are also mobile cart stands for LED televisions that shield your set from the elements while allowing you to wheel out your LED for outdoor get-togethers or family reunions. A protective case and outdoor stand is a great way to increase the led skylt utomhus versatility of your LED set without breaking the bank a second time. As you probably already know, LED televisions tend to cost slightly more than regular LCD or plasma televisions. You should expect a full-length DivX/XviD movie to be about 600MB to 700MB in size. If the movie is more 123movies123 than 2 hours long it will require even more space to ensure the quality is good. Globex is an international organization that provides that IELTS test and certificate once the person has cleared the test successfully. The results are the main reason to take the test these test results are provided to Globex by the IELTS. It is not a hectic task to see the results of the test like in other organizations. In Globex, the person can simply go to Globex Documents and see buy ielts certificate online the results. In order to verify the results the person can simply go to the IELTS official website and simply log in and check the test report, it will be same as the documents sheet provided by the Globex Documents. How Does The Baby Affect Stress? How Has the Baby Affected Our Phone Usage? What Foods Cause Problems for Breastfeeding? How Stressful was Child Birth?